Bake 9 to 11 minutes or until edges are set. Immediately remove from cookie sheets to cooling racks. What is baking chocolate? In its most traditional form it’s unsweetened, made from 100% chocolate liquor—which is processed and ground cocoa beans. It’s used in recipes that have enough sweeteners to balance its bitterness, serving up a deeply satisfying chocolate flavor. Baking chocolate is sold in blocks, chunks, and chips—each ready to be chopped, stirred into a recipe, or melted. Use baking parchment to line your baking sheets to make removing the warm cookies a breeze—reuse the sheets multiple times before recycling or composting them. Because this dough is a dark, use your fingertip to check for doneness—err on the side of removing them from the oven a tad early rather than risk overbaking them. For mocha crinkle cookies, substitute some dark brown sugar for the granulated sugar and stir a few teaspoons of instant expresso powder into the dough. Another dash of vanilla amplifies all the chocolatey goodness of the cookies. Sometimes kitchen chemistry can seem almost magical. After just a few minutes in an oven, a humble mix of raw ingredients can be transformed into something amazing. That’s certainly the case with crinkle cookies. As they bake, they create a unique topography of hills and valleys, crags and nooks, all filled with chew, gooey chocolate and a delicate dusting of powdered sugar. It’s easy to make this dough ahead of time and keep it on hand in the freezer for when that “home-baked cookie” urge strikes. You can even roll the dough into balls ahead of time to speed up the process. Once the dough is thawed, you can roll dough balls in a shallow dish of powdered sugar and pop them in the oven. 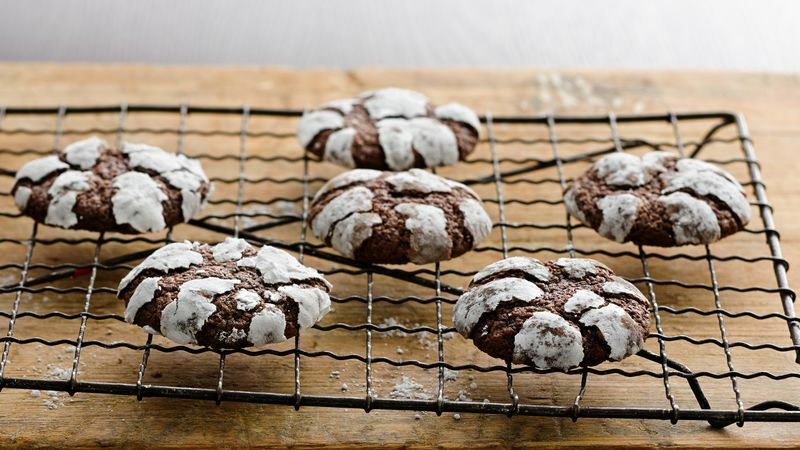 While this classic recipe is widely acknowledged to be straight-up chocolate perfection, feel free to explore some variations on the theme of chocolate crinkle cookies. Check out Betty’s best chocolate crinkle cookies to learn more about fun new recipes.